Before my dad took me to the airport last night we stopped at Andina in Portland. We had talked about Peruvian restaurants and that we had never been to any. Then I was reading his AAA magazine and Andina was mentioned - so I called for a reservation. They brought out bread with a triple dipping sauce tray. One was a satay-like dipping sauce with a peanut base. The second was a sweet one with passionfruit as its base. The third was a green jalapeno, cilantro-y concoction. Each one was a little spicer than the prior. Of the three, I preferred the last one. I'm still bad at remembering to take pictures of food before I do my blogs. So I missed the appetizer. It was Causa, a traditional preparation of potato mixed with fresh key lime pressed into a cake, with savory fillings and served cold with avocado. We chose the MIXTA NIKKEI - spicy tuna, crab salad and crispy shrimp. It was a new flavor experience for us. The potato with lime as the base, topped with the crab salad, tuna chunks, and then fried shrimp. Only the shrimp was hot, the rest was cold. Not a favorite, but still a nice new flavor experience. Dad had the LOMO SALTADO - wok-fried Cascade Natural Beef tenders with onions, tomatoes, soy sauce, garlic, and ají, served with rice and fried yuca. He said it was unimpressive and similar to fajitas. 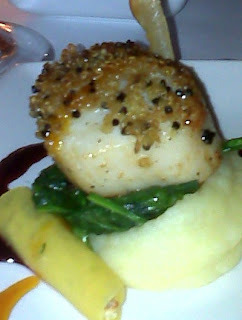 I had the CONCHAS DEL SENOR DE SIPAN - quinoa-crusted diver scallops perched on top of wilted spinach and potato-parsnip purée, with golden beet and crabmeat "cannelloni”, and a duet of red beet and passionfruit reductions. The picture is of one of the three "mounds" that I had on a long rectangular plate. Again, nice, but nothing exceptional. We did, however, thoroughly enjoy our desserts. 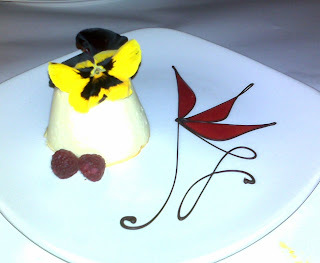 I had the FLAN DE QUESO DE CABRA - creamy goat cheese and lemon mousse, served with fresh raspberries laced with basil and habanero. The goat cheese was not too strong, although by the time I finished it, I had had enough of the goat cheese flavor. Don't you love the plate decoration? They took more time with the chocolate and syrup swirls than any other restaurant I've seen. 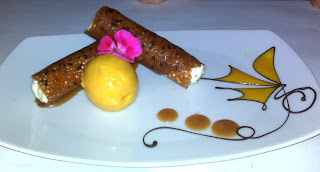 Dad had the CANUTOS DE QUINOA Y MARACUYA - crisp quinoa studded cannolis stuffed with passionfruit mousse, served with mango-lemongrass sorbet and caramel. We both loved this one. Andina is on the corner of NW Glison and NW 13th in Portland.